The Graphic Systems Division of FUJIFILM North America Corporation announces the release of the first product in its Samba Printbar System line, the Samba PS4300, for the commercial and packaging printing segments. The Samba PS4300 is a compact printbar system designed to be easily integrated into most existing print equipment or manufacturing process adding variable inkjet imprinting capabilities with unsurpassed print quality at revolutionary speeds. This new printbar system adds an inline digital printing option for a wide range of personalized or data printing applications including text, log os, QR and barcodes and graphics. 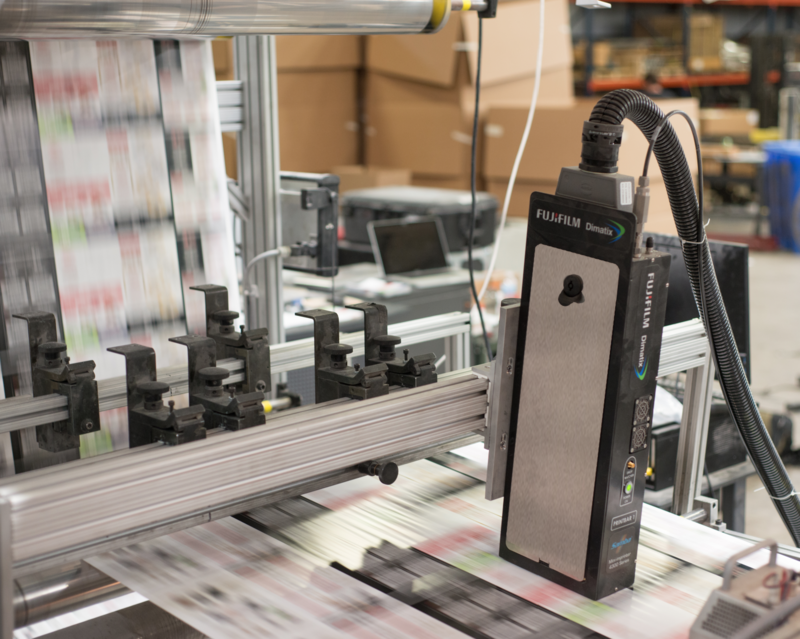 The system integrates the ultra-reliable Samba Printhead technology paired with fit-for-purpose inks developed by Fujifilm. The Samba PS4300 has a print width of 1.6 inches, with each printhead depositing billions of drops per second, delivering a native 1,200 dpi and speeds up to 1,000 feet per minute. The Samba PS4300, pictured right, is available with up to four discrete printbars, depending on the customer and application requirements. Each printbar can be easily integrated into an existing offset press or manufacturing line and operated from a single controller. The Samba PS4300 is designed to bring new capabilities to existing offset presses, flexo presses, mailing tables, and more, offering printers more value to their existing manufacturing platforms. Uptime on the Samba PS4300 is impressive, applying Fujifilm’s patented RediJet® ink recirculation system, ensuring printbars are instantly primed, resulting in faster time to print, minimal material waste and improved reliability. For more information on the Samba Printbar System line, go to www.fujifilminkjet.com/samba.